The town of Salem was situated in such an area that troops passed through on a regular basis as they traveled up and down the eastern coast. Salem was part of the Wachovia tract that was granted to the Moravians by the British. 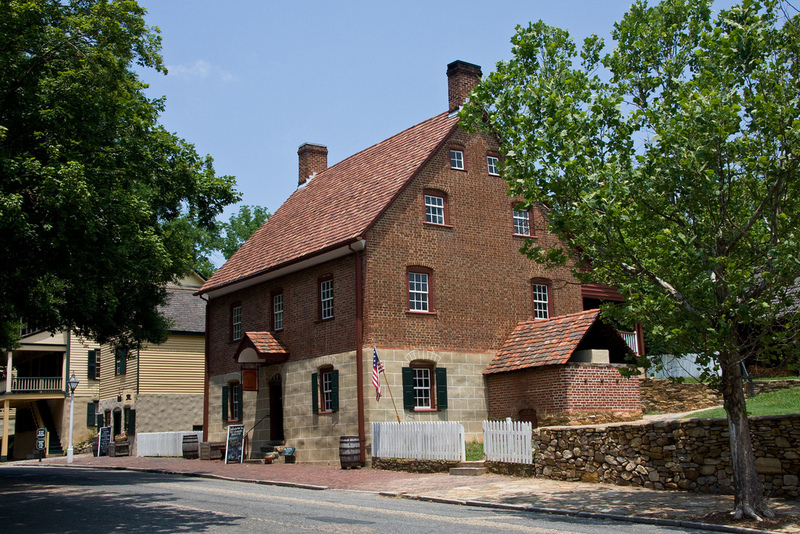 Based on their religious beliefs, Moravians were exempted from military service. The Moravians, who referred to themselves as the Brethren, “had become known as obedient subjects who never questioned the authority of the existing government)”Ruth Blackwelder, “The Attitude of the North Carolina Moravians Toward the American Revolution,” from The North Carolina Historical Review, Vol. 9, No. 1 (January, 1932), pp.1-21. Published by: North Carolina Office of Archives and History http://www.jstor.org/stable/23514879 . When the Moravians were subjects of the British, they were considered to be Tories. After 1776, they were loyal to the Revolutionaries. Even so, some Revolutionaries distrusted them. The Moravians kept immaculate records. One such record is the “Diary of the congregation in Salem, 1781.” It is part of Records of the Moravians in North Carolina, edited by Adelaide L. Fries. The following account is from the February 7, 1781 diary entry (page 1674). The previous American troops to pass through were well-mannered and compensated residents for resources required by the troops. However, the troops that came through the evening of February 7 seized goods based on their authority as government officials and threatened residents with harm if they did not provide materials demanded. General [Daniel] Morgan’s Brigade-Major, named Brooks, came from the army, near Spurgeon’s, and looked over the town. An officer came from General [Nathanael] Greene asking for boots, but there were none to be had, and they both left most politely. About four o’clock in the afternoon a hundred and seventy-odd of the Wilkes Militia arrived unannounced. Their Captain, Herndon, first demanded brandy, which was furnished; then he wanted meat and bread or flour, and the flour was supplied; then he insisted on having meat, and some of that also was furnished. Then he and the Captains with him tried to press powder from Br. Baggepressure Brother Bagge to give them gunpowder; he replied that he had none, but there was a little leadLead was needed for making bullets. It was in short supply during the Revolution. belonging to the public which was at their service if they thought wise to take it. They insisted that we had powder in the town, and that it must be given to them. Their demands were finally ended through the arrival of their senior Captain, [William] Lenoir, who brought more men. The requisitions began again about seven o’clock. In the Tavern many ate and drank as they pleased, and there they took three bundles of oats; the Single BrethrenThe unmarried brothers, or members, of the Moravian church. had to give them half an ox, 100 lbs. of meal, and several gallons of brandy; the store furnished corn and salt, the potterya place where pottery was made had to supply ware, and in addition they took whatever came to hand. All these demands were made with threats, which sounded as though they sought an excuse to plunder the town. One Captain said he had inquired about the people in the town and had found that some were for and some against the common cause, and the formerthose who supported the Revolutionary cause should now show it. Lenoir declared roundly that we were his enemies, but for the time he would not harm us except that we must give what they needed and demanded. After we had had much trouble with them, and felt the Power of Darkness, they left about ten o’clock at night, with a show of politenesspretended politeness, taking the public lead, cut into small pieces. Prior to leaving, several of them went into the town, represented themselves as ToriesSome of the soldiers pretended to be Tories, enemies of the Revolution, in order to test the loyalty of the Moravians of Salem. and tried to lead the Brethren to join them, but they did not succeed, for the Saviour gave our Brethren grace to speak cautiously, and protected them from harm. After eleven o’clock, three of them came back into the town, and were forbidden, by the nightwatch, to roam about; they claimed that they were looking for a deserter. After they left, the night was quiet. The diary of the congregation at Salem, 7 February 1781, in Adelaide L. Fries, ed. Records of the Moravians in North Carolina (Raleigh: Edwards & Broughton, 1930), 4:1674–75.